Radiant heated floors certainly beat baseboard heaters in several aspects, but perhaps the crowning feature of heated floors is the maximum flexibility they offer consumers. Electric radiant heating offers three main aspects of flexibility that baseboard heating systems don't: installation freedom, variety, and custom design plans. Baseboard heaters can usually be installed in any room, whether the house is old or new. Finding the wall space, however, can be a tricky task. Additionally, having to rearrange your room to accommodate a baseboard heater isn’t exactly fun. When it comes to choosing a baseboard heater, there aren’t that many options to choose from. All baseboard heaters are essentially the same poor quality that leaves much to be desired. 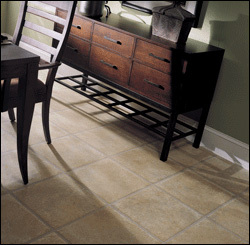 With a radiant heated floor system, however, you have a slew of high-quality products to choose from. A great place to view some of the best radiant heat products is the Warmzone website (www.warmzone.com). Warmzone is an ideal example of an established radiant heat provider offering products that are regarded as the "best in class" and available at competitive pricing with comprehensive customer services. Whether you choose ComfortTile heating mats or cable, In-Slab heat cables, or HeatShield floor heating insulation panels, you’re sure to be satisfied with your heated floors for years to come. Warmzone designs a custom radiant heating plan designed around your needs. They understand your needs aren’t the same as the next customer’s, and they’ll design a customized plan of action (complete with AutoCADs) to make sure that your radiant heated floors not only meet but exceed your expectations. Read Radiant Heat vs. Baseboard Heating (Part I).